Welcome to my grade two class of 2017/18! 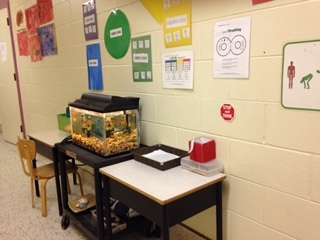 A quiet relaxing place in the grade two hallway. A place you can go whenever you need a break or need to get back into the green zone (Zones of Regulation) so you are ready to learn. We can colour, watch the fish, use play dough and some other sensory items. We can also practise belly breathing, stretches, and mindfulness. It is a pretty special spot! Welcome to my blog. I am the Grade two teacher at Sherwood Elementary.